"Don't ever be afraid of failure or low mood - these are our opportunities to learn about ourselves." We ask Nutritionist Resource member and registered dietitian, Dalia Maori to share her story. 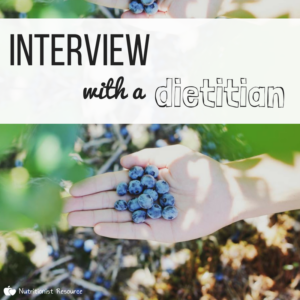 She shares the reasons why she became a dietitian, how she works with clients and her tips for those looking to start their wellness journey. What do you find is the most common issue for clients looking to start their wellness journey? Overambitious goals. While clients goals are often very admirable and correct with respect to nutrition science, the speed at which they seek to achieve them can often be overambitious. We do not live in vacuums; we have work and home lives to maintain while making changes to often long-ingrained habits. Ensuring a step by step approach is more sensible than expecting overnight changes from ourselves. I feel like a lot of this attitude comes from the diet mentality peddled by many weight-loss companies and products. The truth is, there isn’t usually a true rush to get to a wellness goal in a very short time: the journey is sometimes even more important than the destination, and the wellness destination isn’t static. Our nutritional/wellness needs change as our lives evolve, which means having a fluid, creative, reasonable and flexible attitude is vital for the true maintenance of wellness. What inspired you to become a dietitian? Did you always know? I was inspired to become a dietitian after healing myself from chronic digestive problems which really challenged me in my teenage years. Doctors did not seem able to offer me any help and taking medication they recommended to me felt intuitively wrong. I wanted to understand how to return my digestive system to optimal health, instead of just silencing the symptoms it was communicating to me. Once I realised that I wanted to prevent others from suffering the isolation of a condition like I did, the focus on that goal never dimmed. I am now 15 years into my great love for nutritional medicine and love it more each day. I still have so much to learn! I feel very blessed to have one of the best jobs in the entire world (no exaggeration there). You work in a way that combines your clinical background with a holistic, intuitive approach. How do you think this helps clients? Firstly, I couldn’t work any other way: I am an intuitive person and highly sensitive to others – turning off these skills would be completely unnatural and block much of the healing energy that enters the room when I treat someone. Part of succeeding in life involves utilising our natural skills in our professions. I work holistically because we are all one being – our physical and mental health are intricately intertwined and not to be separated from each other. True healing comes when we work on both simultaneously (modern medicine often skips this principle). Maintaining clinical excellence is a vital component of how I work because I deeply respect nutrition science. Clients are quite rightly expecting evidence-based advice from a clinician who has been highly trained – I won’t compromise on this. I believe this combination helps clients because they undergo a journey of self-discovery. They find out what works for them as individuals and leave my practice with a full tool kit of how to essentially be their own nutritionist. My goal is always to empower my patients to be able to self-monitor, self-advise and be able to control the inevitable bumps which come along in life with our eating behaviours. The ultimate achievement of this method is that these clients can step away from the diet industry, which makes so much money, while providing little long-term success for the most part. What are your top tips for maintaining a healthy, happy lifestyle? Avoid processed foods and drink plenty of decaffeinated fluids. Surround yourself with positive people who simply make you feel energised. Create strong personal boundaries (avoid being a ‘yes’ person). Maintain a spiritual practice – it doesn’t matter what it is as long as it gives you a sense of meaning and harms no one. Take long walks in nature and stretch as often as you can. Sleep well and on time (keep a routine as much as possible). Laugh a lot. Eat with others. Keep a diet which is mostly plant based. Ensure a good source of protein three times a day. Find your calling and run with it. Don’t ever be afraid of failure or low mood – these are our opportunities to learn about ourselves. Avoid blanket statements and the people who make them. Take probiotics and a vitamin D3 supplement. How lycopene can reduce your risk of prostate cancer What can we do about type 2 diabetes?